Artist: The Choir of Trinity Wall Street; Julian Wachner, cond. 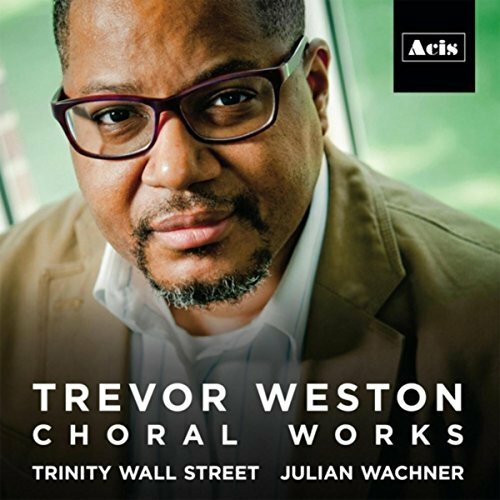 This collection of powerful and eclectic choral music is the first album dedicated entirely to celebrating Trevor Weston’s compositions. The Grammy nominated Choir of Trinity Wall Street performs under famed conductor Julian Wachner, with the Trinity Youth Chorus and NOVUS NY (Trinity’s resident contemporary music orchestra) providing accompaniment on a few selections. Weston is Associate Professor of Music at Drew University and has received several honors throughout his career, including the George Ladd Prix de Paris from the University of California, Berkeley; a Goddard Lieberson Fellowship from the American Academy of Arts and Letters; and residencies from the Virginia Center for the Creative Arts and the MacDowell Colony. Weston embraces both sacred and poetic influences in his musical compositions. In the album liner notes he discusses the inspiration and motivations for each piece. For instance, Weston wrote “My Heart Hath Trusted in God” after searching through collections of short expressive texts from the English Gradual while working as music director at a small Anglo-Catholic church in Berkeley. Certain compositions reflect expressions of collective African American experiences. “Truth Tones” was written to celebrate Dr. Martin Luther King, Jr. and the “revelation of hidden truths” using texts from the African Saint Augustine and the African American poet, Paul Laurence Dunbar. In “O Daedalus, Fly Away Home,” the choir engages in a percussive stomp and clap similar to the traditional juba patting performed during slavery. The piece was based on a poem by Robert Hayden that combines Greek mythology with the African American folktale, “Flying Africans,” to evoke the spiritual flight away from adversity. My days are gone like a shadow. This 15-track album eloquently expresses Weston’s interest in exploring the limits of creativity within sacred and secular thematic elements.